Happy New Year! One of my resolutions this year is to get back into blogging regularly. Today, I'm starting the year once again with the First Book of the Year challenge hosted by Sheila at Book Journey. My first book for 2017 is A Man Called Ove by Fredrik Backman. I had it on my wish list and ended up with two copies! One from a Secret Santa book exchange and the other from my neighborhood book club exchange. We will be discussing this book in February so I'm getting a head start on it today. 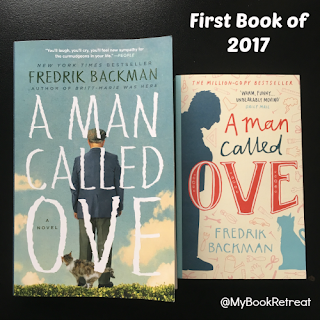 What's your first book of 2017? Happy New Year! I've been reading less and less each year, and blogging less and less. My goal this year is to read and blog more than last year, to try to reverse this downward trend! Great to see your post and to see you will be back more often. Great choice for a first book of the year. I've heard a lot about this book and this author. I hope it is a great start to your bookish 2017!